Vegetable broth consists of a variety of vegetables including, but not limited to: onions, carrots, celery, spinach, mushrooms, tomato and turnips. It can be used used for soups, baking, casseroles and other types of cooking. Vegetable broth can be bought at grocery stores in cans, boxes and jars. It may even be bought as a powder and reconstituted by adding water. 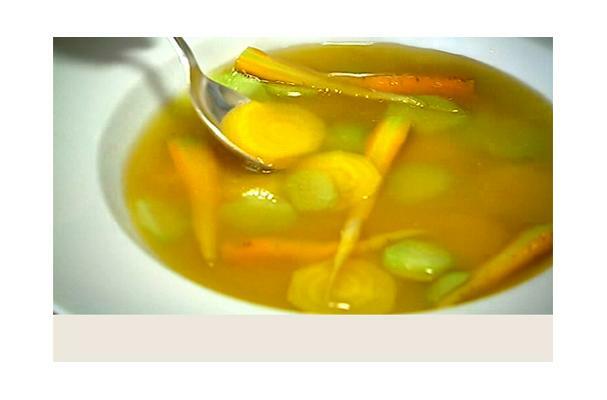 Vegetable broth is a liquid that is typically a golden yellow or light brown color. If bought as a powder, it should be finely milled. Choosing: Choosing a vegetable broth is based more on personal preference than by looking for certain features. You can find vegetable broth in organic and non-organic varieties at stores. Buying: Vegetable broth is widely available at grocery stores and it may be possible to find homemade varieties at farmer's markets. Several varieties can be purchased at local stores and even at specialty and organic only markets. Vegetable broth can be used in several different recipes to add flavor. It can be used as a substitute for chicken or beef broth in soups, added to mashed potatoes in lieu of milk to offer a low calorie alternative and even used in a roux to enhance the flavor of a white sauce. Cleaning: Vegetable broth should not need to be cleaned or sterilized before use. However, if you would like a clearer broth for presentation purposes, an egg white may be added during simmering to catch the the sediment. The egg whites can then be strained out. Unopened broth can be stored at room temperature in cupboards. However, once the broth has been opened it is important to refrigerate it and use any remaining within the 7-10 days after opening. History: There are no definitive details as to when vegetable broth was created but has likely been around for centuries.